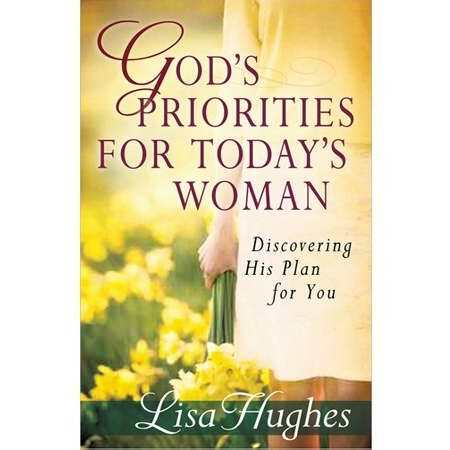 The entire book focuses on these few verses, which are backed with "the priorities" (in relation to the title of the book) that God has for women. I have so many pages bookmarked that I'm not even sure where to start in the discussion of it. As I mentioned, I thought that Hughes was going to focus on the modern woman but she puts these fears to rest right from the get-go. She had me at hello, to put it another way. I find it so disheartening to open books about "today's woman" and hear them trying to suggest that it's hard to apply Biblical truths to our lives because we are so different than the early church. Not so. We're all human with sin issues and we struggle to follow after the commands of Christ. We can try to make excuses but they will not be valid ones. It is better to accept that we are imperfect, that God is perfect, and that His word is God-breathed, useful for teaching, rebuking, correcting and training in righteousness. (2 Timothy 3:16) For all time. Every single chapter will cause the reader pain in some form or fashion - which is a good thing. I had my "pet" topics, of course. It is hard to grow in holiness. I don't always like seeking out advice from older women. I don't always love my family effectively. Well, Christianity is HARD WORK! Anyone who says that following after Christ is easy, or that you can expect blessings upon blessings (without any struggles, mind you) is selling you something. It's a tough row to hoe! But what is the point of all of this, ultimately? Is it to learn how to be a better Christian so that other people will like you? Is it so that you'll develop good habits that will cheer and enthrall those around you? No. It is to bring glory to God. That's why we press onward in the faith, isn't it? To learn more of who God is, what He has called us to and to learn what He has for us and how we might know best how to glorify Him and enjoy Him forever. Naturally, if you pursue these "arts" as listed above, your family will benefit. Your friends will enjoy your company just a little bit more than before. You will be able to set your life priorities and pursue them more wholeheartedly, with less distractions. The closer we grow to Christ, the more we become like Him. The more that we become like Him, the more effective we will be in glorifying Him and enjoying Him. Hughes speaks wisely and well in God's Priorities for Today's Woman . She is patient and loving, yet firm in her belief that scripture is healthy and good for Christian women of today. Scripture - and its truths - have not changed over time. Rather, it is designed to help instruct and change us and I appreciate Hughes conviction in this. I highly, highly recommend it and wish I had more time and space to talk about it. I may pick a topic or two on occasion to talk about as the "inspiration strikes" but in the meantime, check out this book! Thank you to Harvest House Publishers for sending me a copy to read. I am very happy to say that Harvest House has offered a copy to one of my readers here at Reading to Know! Would you like to win? (Well, maybe you wouldn't because it will convict you!) Simply leave a comment below. This contest is open to U.S. Residents only and will be open through Tuesday, May 10th. THIS CONTEST IS NOW CLOSED. THE WINNER, AS SELECTED BY RANDOM.ORG IS #3 - AMY at Hope is in the Word. This sounds worthy of our next Bible study....which will be soon. I will recommend it as an option. I see that there are questions at the end of of each chapter, too...another bonus! I would love to win! So often books for women don't focus on anything but submission and caring for the home, so I was encouraged to see that this one has chapters that go beyond those aspects. Sounds like a book I could use right now!! Very impressive review. You've definately sparked my interest. This is a book I would love to read! This is a book I NEED to read. Wow! Your review makes me want to go out and get it right away. I skimmed over it at first because I've read so many books along this line. . .but I still have tons of growing to do, and focusing on it again would certainly be good for me. sigh, conviction and all! :) I really appreciate the tone as well as the message. I enjoyed your review and would love to read God's Priorities for Today's Woman :) *Thanks* for the giveaway! I'll risk the conviction and say I'd love a chance to win this. Speaking pleasant words? Self-control? Um...yeah. I see conviction aplenty waiting there for me. :) Thanks for the review and chance to win! Thank you for introducing us to this book. I'll certainly like to win one! I'd love to read this book, and I've got 3 grown daughters to share it with! Thanks for reviewing this! I have been pondering Titus 2:3-5 for a couple of months. This sounds like something that would greatly help my pondering! Thank you for the opportunity. I would really like to read this book... and then share it. Although conviction is way down on my priority list (lol), I would like a chance to win this book! Thanks for the giveaway. I'd love to read this book! We want to start a Titus 2 ministry at our church and this sounds like a good reference book. I don't think I would have reacted that way to the title at first -- it seems to me just to indicate she's applying Biblical truth to current times. But so much written along this line these days is so tainted with feministic views, I can see how you'd be wary. At first I wasn't going to enter for the drawing because I have so many books along these lines already -- but after a second look, yes, I'd be interested in the drawing. No matter how much we hear or read about these topics, we still need constant convicting and tweaking and readjusting our attitudes and actions to be more in line with Scripture. I could use a little help in every area! Count me in :). Looks like a great book! I have been looking for a book to work through with a young lady at our Bible study/discipleship times...I will definetely check into this book! I agree that this sounds like a great book for a women's bible study. Thanks for the giveaway! This sounds like an amazing book and one I would be incredibly interested in reading. I am very curious about what the modern "evangelical feminist" is. I would be interested in this book as well. Did you ever read Elizabeth George's Woman After God's Own Heart? I think that's what it's called. I read it when I was a younger mom, and it sounds similar. Really changed my perspective.